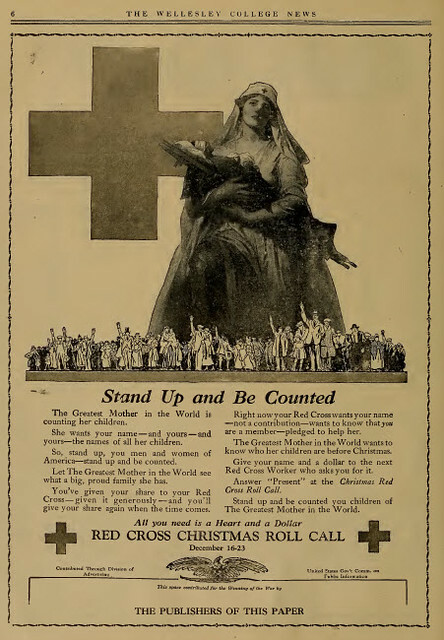 Some of the ads in the Wellesley News during the 1918-1920 period make direct and indirect reference to World War I and its aftermath. This is one such case and an interesting one at that. Here is the call by the Red Cross to get involved. I'd be curious to see what other publications this advertisement ran in. In fact, I would like to have seen all of the ads that they used and where they were published. This one, with it's young maternal figure holding a wounded soldier and the first line of the text saying "The Great Mother in the World is counting her children." It certainly plays to the feminine ideal. What would a male-version of this look like, I wonder.